Dr. Palika Sharma is an experienced Dentist in Majitha Road, Amritsar. She has been a practicing Dentist for 7 years. She has done BDS . 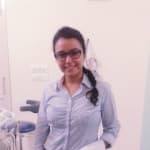 She is currently associated with DR PALIKA DENTAL CARE CANTRE in Majitha Road, Amritsar. You can book an instant appointment online with Dr. Palika Sharma on Lybrate.com. Lybrate.com has a number of highly qualified Dentists in India. You will find Dentists with more than 26 years of experience on Lybrate.com. Find the best Dentists online in Amritsar. View the profile of medical specialists and their reviews from other patients to make an informed decision. Ybrate 200 When I am doing brushing on teeth then why little bit water comes from gums can you pls tell me how I stop it? Thats why it takes 30-40 minutes time on brushing. It seems there is problem in your brushing technique. You must avoid aggressive brushing, do brushing in vertical strokes, brushing for 2-3 minutes is enough 30-40 minutes brushing daily will instead damage your teeth. Use mouth wash at least once a day. I am a male 58 years, I get mouth ulcers often and sometimes in the tongue could you please tell me the reason for same and remedy, if any diet changes required, I am a vegetarian mostly, also I have acidity and have problem while lying down. Hello ulcers can be caused due to unbalanced diet, stress, trauma or hormonal imbalance. In your case acidity can be one factor. So get treatment for that, drink lots of water, take some multivitamins and lastly apply oral gel on ulcers for immediate relief take care.